We have collected and compiled research about the benefits of, and strategies for overcoming the barriers to, U.S. citizenship. In February 2019, Boundless Immigration, a technology company that helps immigrants navigate the green card and naturalization process, released a new report, The State of New American Citizenship. Based on an analysis of data from the U.S. Department of Homeland Security (DHS) and other sources, the report makes clear that the process of applying for U.S. citizenship has become far more difficult than in previous years. Further, the report found large regional disparities, with wait times far longer in the Southwest and South Florida than in other regions of the country. This report uses public data sets to understand national trends in the government’s handling of citizenship applications, as well as barriers at the local level. In January 2018, the Stanford Immigration Policy Lab (IPL) published new research on the financial barriers low-income immigrants face to becoming citizens. An innovative program, NaturalizeNY, developed in partnership with the New York State Office for New Americans and supported by Robin Hood and New York Community Trust, had a dramatic effect on naturalization rates among low-income New Yorkers: providing a fee voucher to cover the full cost of the application doubled the application rate. The program offers a model for communities large and small that want to help immigrants to become citizens. For low-income immigrants (incomes between 150-300% of the federal poverty guidelines) who are not eligible for the full federal fee waiver, a fund could be established with public and private support to cover application fees. Read the research brief here, and see the infographic from IPL on the right. To learn more, visit the IPL’s webpage on the research here. This brief by the Center for the Study of Immigrant Integration at the University of Southern California examines the impact of the reduced fee by offering estimates including: the number of the eligible-to-naturalize populations by poverty band (for all 50 states), the number by countries of origin and poverty status, and more. The brief includes estimates of individuals eligible for the fee waiver and the reduced fee to apply for naturalization. 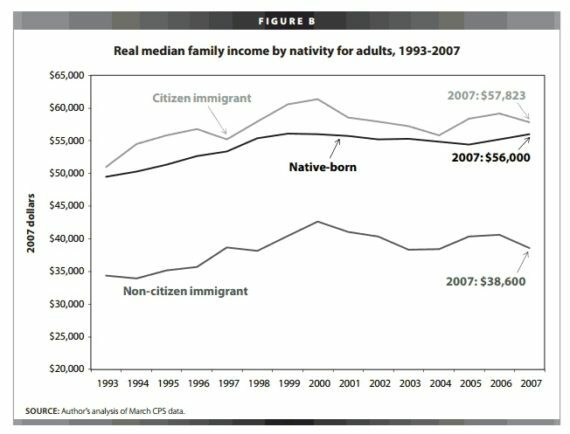 On January 8, 2015, New Americans Campaign partners participated in a webinar that included research by Manuel Pastor and Jared Sanchez of the University of Southern California (USC) and Patrick Oakford of the Center for American Progress (CAP). 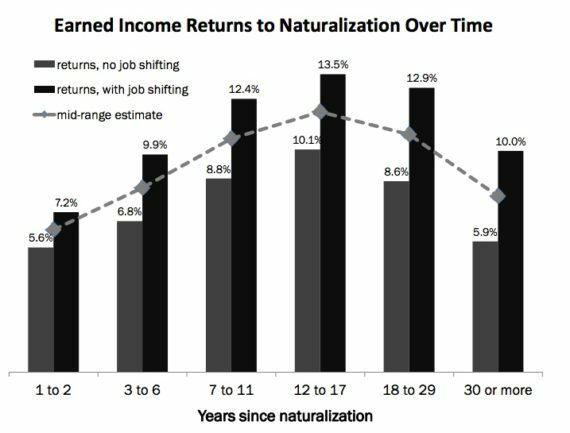 This research shows that the number of low-income immigrants naturalizing is lagging that of immigrants with higher incomes, revealing how the cost of citizenship is a systemic barrier for some populations pursuing naturalization. Learn more about these important findings and how to address the high cost of citizenship for LPRs. A naturalization application fee increase, as well as a new reduced fee option, went into effect on December 23, 2016. Several studies show that naturalization confers economic benefits, both on the individuals who become citizens, and on our communities and nation as a whole. 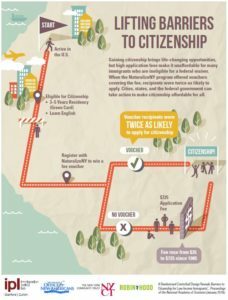 A study published in December 2012 (“Citizen Gain“) found that citizenship, alone, can boost individual earnings by 8 to 11 percent, leading to a potential $21-45 billion increase in cumulative earnings to the national economy over ten years. Below is a list of resources on this subject. 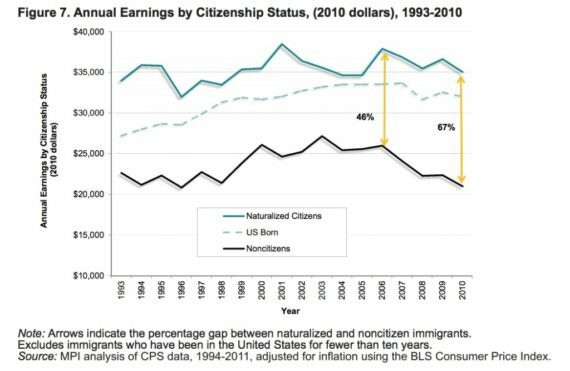 Summary: Using American Community Survey data for 21 cities, this report finds that if the immigrants who are eligible for naturalization became citizens, their earnings would increase 8.9 percent, and combined earnings for the 21 cities would increase $5.7 billion. Federal, state, and city tax revenue would increase $2.0 billion. Expenditures in government benefits would decline $34 million in New York City and increase $4 million in San Francisco. With an additional $789 million in taxes for New York City and $90 million for San Francisco, the net fiscal impact of naturalization on these two cities is overwhelmingly positive. This motion graphic about immigration and growth spotlights the contributions immigrants make to our economy and our country. You can watch it below. Eric Cohen, Executive Director of Immigrant Legal Resource Center, the lead agency of the New Americans Campaign, participated in a panel during an event at the George W. Bush Presidential Center, Dallas, July 10, 2013. Other panelists were Ali Noorani (Executive Director, National Immigration Forum), Manuel Pastor (Professor, University of Southern California, Co-Director, Center for the Study of Immigrant Integration), and Richard Vedder (Distinguished Professor of Economics Emeritus, Ohio University). Summary: This report finds that Latinos in California, among other things, are more engaged financially and more likely to invest if they are naturalized citizens. Summary: Using data from the 2011 American Community Survey (ACS), this report finds notable differences in homeownership rates among foreign-born households by citizenship status. While 66 percent of naturalized U.S. citizen households were owner occupied, 34 percent of noncitizen households were owner occupied. Naturalized U.S. citizen households were also more likely than non-citizen households to have paid off their home mortgage. Click here for an infographic from George Washington University’s FaceTheFacts.USA.org project. Summary: This report finds that citizenship, alone, can boost individual earnings by 8 to 11 percent, leading to a potential $21-45 billion increase in cumulative earnings over ten years that will have ripple effects on the national economy. It includes a 3-page summary brief, and an infographic. Summary: This report states that naturalized citizens earn more than their noncitizen counterparts, and are less likely to be unemployed, and are better represented in highly skilled jobs. This 2010 report finds that immigrant workers who are U.S. citizens earn higher wages and experience lower levels of poverty than non-citizens, and that this benefit remains even after controlling for other factors.